Pedro Wonaeamirri (Gurrumaiyuwa) was raised by his grandmother, Jacinta Wonaeamirri, at Pirlangimpi (Garden Point) on Melville Island; she taught him the traditional cultural practices of his grandfather. Wonaeamirri’s artistic career began when he made his first ceremonial tutini or funerary pukumani pole for his father-in-law. Like many Tiwi artists, Wonaeamirri is an accomplished singer and dancer – key forms of expression in Tiwi culture. He maintained his art and dance practice during his secondary and tertiary education in Darwin, leading dance troupes and studying visual arts. In 1991 Wonaeamirri, aged 17, began working at Jilamara Arts and Crafts at Milikapiti on Melville Island both as an artist and in the leadership roles of president and vice-president. 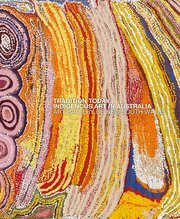 He worked alongside other noted Tiwi artists, such as Kutuwulumi Purawarrumpatu and Taracarijimo Freda Warlapinni. Wonaeamirri is one of the few Tiwi people of his generation who speaks old or classic Tiwi. In his art practice, Wonaeamirri works within the strong Tiwi tradition of using pwoja (body designs), describing his works as an extension of the pukumani ceremonial body designs. His works are graphic expressions of dance and song that capture the essence of performance. Wonaeamirri has mastered the traditional techniques of painting in natural ochres collected from his country, rendered with kayimwagakimi (the traditional Tiwi iron-wood comb), and refined the process into his own unique style. Strong fields of colour are illuminated with geometric ‘dot’ patterns painted on canvas, paper, barks and ironwood sculptures. Wonaeamirri has travelled and exhibited nationally and internationally, and his work is represented in Australian state galleries and museums. 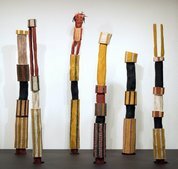 In 1999 he was commissioned by the Art Gallery of New South Wales, Sydney, to create six ironwood pukumani poles from ochres, feathers and beeswax. These works were inspired by a visit to the Gallery in 1998, when Wonaeamirri studied the group of 17 tutini that were commissioned by Dr Stuart Scougall for the Art Gallery of New South Wales in 1958. This monu-mental group of sculptures was the first Aboriginal work to be accessioned as ‘art’ in a public gallery and, at the time they entered the Gallery’s collection, their inclusion was regarded as controversial. Acting as a counterpoint to these, Wonaeamirri’s tutini exemplify the connection of the contemporary artistic practices of Milikapiti with an illustrious past.